We are very proud of our puppies all grown up! Our customers give us never ending compliments about their pups from us. Many are repeated customers. We are happy to give out names and email info from our very satisfied owners upon request! Dec 2016 ~ Hi Karen! Happy Holidays! We hope you and your family are doing well! 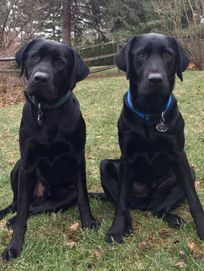 We wanted to share this picture of Tucker (green collar) and Gunner (blue collar) with you. They have grown up to be the most handsome boys and sweetest dogs! Now that I live closer to my parents, they get to see each other much more often. They absolutely love it and run around the yard for hours! Thanks so much again for these wonderful pups! It’s been a while since we spoke. This past January Catie turned 5 years old she has as much energy today as the day we took her home, she is so smart and attentive and was so easy to train to commands. She gets nothing but compliments from everyone whether on a walk or out in the fields. She is a real social buttery loves everyone. We just would like to thank you again for bringing this young lady into our lives. She came from great stock Ruger and Sky. 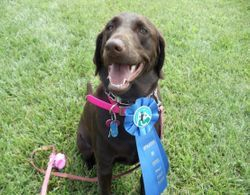 You have the talent and care to produce such great dogs and also many become champions. A recent reference from a Lamborn's puppy buyer (former litter) to a potential customer for this litter. Yes, they purchased a pupper!!! 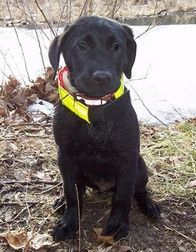 I’m so glad you contacted me, because I have nothing but rave reviews for Lamborn labradors! Our puppy, who is also a pup of Lena and O’Reilly, is now 8.5 months old and has been so great. She is not only beautiful, but so amazingly sweet and smart. She is great with our 4 kids, who range in age from 6-13 years. Penny loves the dog park and gets along with other dogs so well. (In fact we have 2 neighbors who have older dogs who have been skittish/aggressive around other dogs, but somehow will only play with Penny). She is also great on trail hikes without a leash. Even from a young age, she would run ahead and then wait for us, always coming right back when she was called. She loves to run around, and has endless energy when she’s chasing balls or playing in the water, yet can be so mellow and sweet at home…definitely a great balance. She loves to be with us, and has been great in the car. We’ve taken her to Lake Placid, NH and Virginia and she travels well! So many friends and strangers have commented on what a good-looking dog she is AND how amazing her temperament is. We can’t go to the dog park without multiple people complementing her. 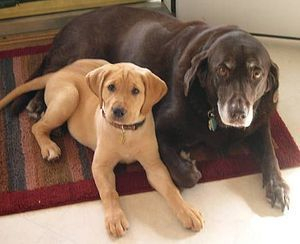 The mix between American and English labs seem like the best of both worlds. 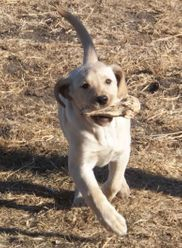 She is so incredibly athletic, is not short and stocky, and has the beautiful head of an English lab. Right now Penny is just over 60 pounds. Our friends got a male from the same litter, and they have also been thrilled with their dog. He is about 10 pounds bigger than Penny already, and has the same awesome temperament. Lena / O'Reilly Pup - Karen, just wanted to drop you a line. In regards to Maya I think a crime has been committed...she has stolen ours hearts. Maya is everything we hoped for, smart, loving, social, and a strong desire to please. At 11 weeks she could sit, lay down, paw shake, retrieve and drop. Except for a few #1 accidents, Maya was nearly house broken when we got her. 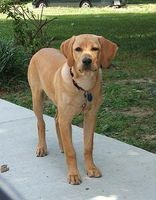 Our Vet says Maya is in excellent health (he has a 1 yr old lab) and wrote down your web site to recommend to future lab owners. Tell Lena and O'Reilly they can be very proud of their daughter. 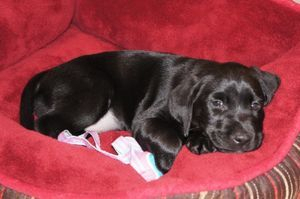 We are all so in love with “pink”, who we have named “Penny” since my husband coaches lacrosse at UPenn. She is an absolute sweetheart, is absolutely beautiful, and is so smart. She has been amazingly good about pottying outside, and does so within 20 seconds of being out! Thank you for making that process easy for us! Other dog owners can’t believe it when I tell them that she’s only had 2 small accidents since we brought her home Friday, both of which where just small tinkles right by the door as she was waiting for me to open it. She loves playing in the yard with the kids and then conks out hard for some well needed rest! Thanks so much for everything. Lena and O’Reilly did a great job! We couldn’t be happier! 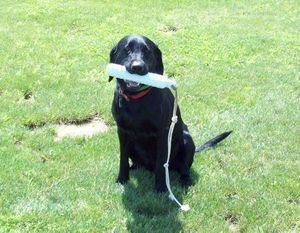 Ruger/Jocie Litter Hi Karen, We just wanted to send you a note to thank you again for Hazel. She is growing so fast and she is so beautiful! We get compliments all the time on how gorgeous her coat is and how sweet she is, and we can't thank you enough. 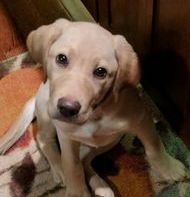 She is learning so fast, she knows so many commands already and housebreaking her was easy because she already knew to go right to the door. We took her out to a field yesterday just to get used to being in a field and she is soooo good. She stays right with us and is so eager to please and get the birds! We recommend you to everyone we know looking for a great dog! Good Morning Karen, We have named the pup...Blitz. He is such a joy and starting to come out of his shell. He just loves to be loved and wants anyone and everyone to pet him. 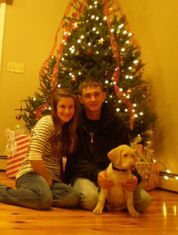 Well here is a picture of us three in front of the tree. Thank you so much for such a joyful dog. His eyes are just so cool!! Will be keeping in touch with you,enjoy the holiday season. Ruger/Jocie Litter Hi Karen, With the litter's second birthday in just a few weeks, I wanted to send you another update on Java. She is an absolute joy! She has incredible drive when you want her to, but is calm and relaxed when appropriate. Java has become the biggest snuggler in the house. She has to be touching you when she sleeps. She has also found her sport: frisbees. She will do anything for a frisbee. She took first place in the first frisbee competition she entered. 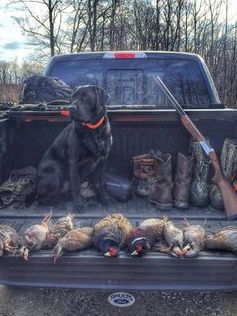 I also took her and Mocha hunting this year for pheasants. She shows excellent natural instincts in the field. The comments I receive about her are endless. She gets compliments about her looks, temperament, and behavior. Java will be taking her therapy dog test in February so she can come to office with me. My dental practice is mainly special needs patients, and a therapy dog has a calming effect. Not to mention, it will be awesome to have her with me at work! Thank you again. I only wish you would have more chocolate puppies. I am a chocolate lover, and am looking to add a puppy to family sometime next year. I have attached a few recent pictures for you. 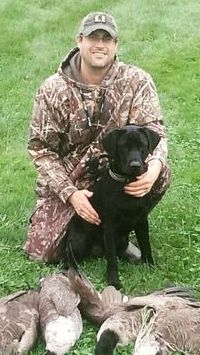 Jocie/Ruger Litter Karen: We named our female Penny, official will be Pennsylvania's Dakota Hunter. Penny weighed 26 pounds today. We were working with a gourd for retrieving today. Very intelligent and loving dog. Jocie/Ruger Litter Dear Karen, I can't begin to tell you how much I appreciate your help in bringing little Major (Maximus Major Rebel Force) into my life!! He is a JEWEL! When I picked him up, I was amazed at how clean everything was! I've raised puppies before and know how spectacular a clean environment is for those little babies, and how much work that involves! Major is so socialized! He loves to be held and really responds to praise! What is truly unbelievable is how you had him practically HOUSE TRAINED when I brought him home on his little 49th day! Soon as he discovered where the door and his back yard are (his first day home!) he knew that was the deal! I took him to the Vet for his little check up (thanks for reminding me!) and the girls in the office wanted to keep him! He was so calm and good! He just held up his little paws for his nail clipping, didn't fuss when he got his shot, gave kisses freely, WHAT A SWEETIE!!! The Vet assured me Major will grow into his feet and ears! His check up was PERFECT! Also impressive, was the immaculate, complete set of records your sent us home with! I scanned them all and gave the Vet a copy...his office couldn't believe it! I've bought precious little babies from some wonderful breeders in the past, but I must say, you take the cake in every department!!! It is obvious how much you love and care for these little rascals! I saw you give little Major a kiss good bye when we left your house. You even made sure his little green collar was on him just right. You helped me arrange his little travel kennel in my car to be sure he could see me when we were driving, you gave me a couple of days of his food, and you even tossed in a couple of little knotted toys with his litter's scent to keep him calm. HOW KIND AND THOUGHTFUL!!! I've never seen a more caring, loving breeder! I will keep you updated on Major's progress. 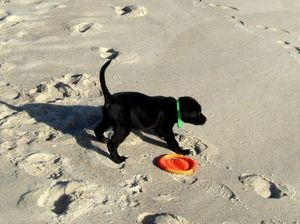 He loves the beach and is getting pretty good on his leash (he is a genius, you know)! He knows his name and already "sits" and is pretty fearless (unless a vacuum is involved)! Thank you so very much! You have provided me with my new best friend! Update: Wrigs is a great dog, maturing all the time and becoming more responsive and disciplined. Wrigley loves hiking in the Maine woods and swimming in the lakes. We love his energy, attitude and character. Cooper is also on our homepage!! Hi, Just wanted to drop a line to say hello. I hope that you are doing well. I wanted to take a minute today to pass along some pictures and comments. Ruger & Sky sure do know how to make a G R E A T puppy! Thank you very much for providing such a beautifully bred, wonderfully tempered and extremely intelligent little girl. Tola has been an absolute joy. She is so intelligent it is scary!! 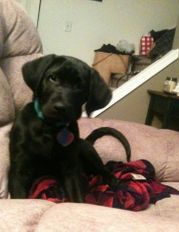 She picks up on commands (both verbal and visual) very quickly and she has integrated into our household very well. Following are some photographs starting with the car ride home to Pittsburgh up to about one week ago. She slept a lot . . . in the beginning. She’s a lot more active now and weighs 49lbs. She’s an absolute joy. She’s become such a big part of our lives so very quickly. She gets many compliments from all of our visitors. You’re name is spreading around here in Western PA! Karen, well Otis is 5 months old now and has been an absolute joy. He is extremely easy to train and listens well. He looks forward to retrieving the paper for me each morning. We take him swimming each weekend and will retrieve until he can't stand up anymore. 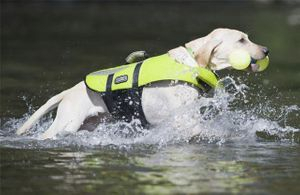 Although his mom makes him wear his life jacket when he is in the water. I hope all his brothers and sisters are doing well. Say hi to Ruger and Sky for him. Duff is also on our homepage! Dear Karen: Coal continues to be doing very well. He was at the Vet yesterday, and the Vet commented that he was very healthy and was very well maintained. He is sitting on command, most of the time, and he is working very well on the leash. He goes to work with me every day, and my staff really enjoy his company. Again, he is everything we could have hoped for and more. Now you can see why at times his nickname is "handsome". I know, when I look at his picture, it warms my heart too! Karen, I have had dogs all my life, but this one is pretty cool! Dear Karen: This email is two-fold. First, Coal is doing great! He sits, stays, and goes down on command. He is staying for 45 seconds, and I increase stay longer each day. He is everything we could have dreamed for, and we are so happy we waited for him. He started swimming at 10 weeks and really enjoys his visits to the water. Housebreaking was very easy thanks to the good start he had. He has been going to work with me, and every one at work loves him. 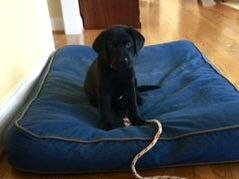 The second reason I am emailing you is to let you know that my sister Val will be looking for a Lab. My sister lost her lab last Saturday. She was 11 years old, and had major surgery two years ago. I thought maybe a pup from Sky would be something for her to consider. 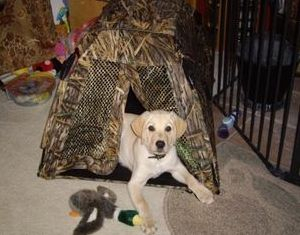 I really want her to get a lab from good breeding, and I know you do everything right. Don't be afraid to send photos of Sky and Ruger to her, she would really enjoy it. Karen, any time you need a reference or if anyone wants to see Coal, Pam and I would be happy to show him to anyone. I get it all the time, everyone who first meets Coal first comments how calm he is, and without prompting, they immediately say something about his coat. Thanks again for everything. Pat D.
My name is Patty O’Brien. We spoke over the summer when you referred me to Sharon Valentino, owner of Lady. We visited Lady and Ruger’s puppies and fell in love with a black female who we call “Winter.” I wanted to tell you what an amazing puppy she is! 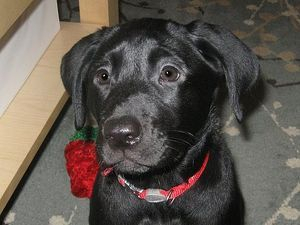 We have had 5 labs over the past 20 years and she is the smartest, most obedient, most pleasant puppy we have ever had! She is 4 months old and weight 40 lbs. She was the largest pup in the litter. Our vet is Dr. Frank Abel who owns Willow Run Vet Clinic in Willow Street. He is very impressed with Winter and has assured us that we have an amazing dog! Winter accepted the crate immediately and learned about the invisible fence in one day. We have a 7-year-old yellow lab who is teaching Winter how to be a well-mannered lab. Besides being a smart dog, she is beautiful! Her coat is like velvet and she has the most amazing face. We would love for you to see her some time. We live in Quarryville so it would be easy for us to drop by. Thanks again for this most amazing animal! References sent to potential customers from happy puppy owners!! 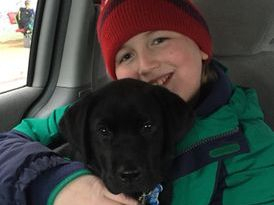 We are very pleased with our beautiful yellow lab puppy "Suki" and our experience with Karen at Lamborn's Labs. Jocie, Ruger and Sky, are in large dog pens on a nice wooded lot. 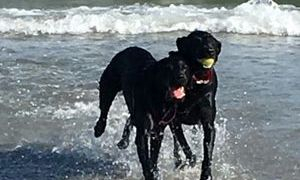 The dogs are all well taken care of, and very athletic and attractive labs. 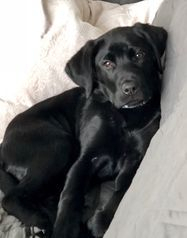 Karen is a very nice honest breeder who takes wonderful care of the puppies and is great about sending updates, pictures and inviting visits during the pups' early weeks. We picked up Coal from Karen on June 26th. I took him to the Vet, and without prompting the Vet without knowing the pup's background, stated to me that the pup was very well maintained. We have Coal now for five weeks. 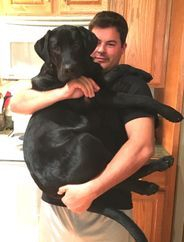 He is now 30 lbs. He learned to sit and stay his first week, and it took him a week to learn down. He is doing well on his leash. Karen moved the pups to a back Kennel at 5 or 6 weeks and this was extremely helpful. Coal has only made about a handful of mistakes in the house, and he has been the easiest dog so far to housebreak. I work for a municipal water company, and Coal immediately started to go to work with me. Everyone comments on his temperment and coat. Coal is not high strung. So far, his conformation is excellent. I plan on starting formal training next month with him. 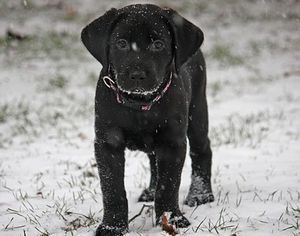 Coal will be our third Lab. 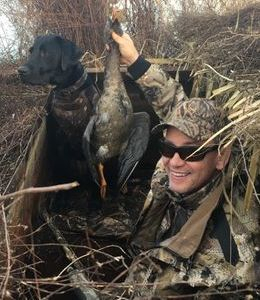 If you are looking for an excellent all around dog that can be used for hunting or just a good companion, stop looking. Make time to go see Jocie and Ruger, you won't be sorry. We had to wait six months, and I am so happy we waited.